Bank institutions need an efficient solution for reducing risk, fraud and insurance cost. Existing security systems have pushed the level of efficiency to the highest possible, covering the "after incident" actions. Hermes Security system provides a solution for the prevention of incidents (robberies, fraud and ATM missuse). Contact us to receive a detailed metrics analysis and a use case. The system helps to build a prevention mechanism that would make bank branches less "attractive" by further reducing the amounts available I the front end desks and ATMS, without reducing their customer service level. The solution uses the existing network ifrastructure between central systems and branches. The central system receives real time data from HW group devices installed in each branch or ATM. Metrics about teller cash balance currently in the drawers, ATM cash level, ATM door open alerts and disconnection alerts are some of the data transfered. Optional, the system receives data from handheld PDA,s. After logical processing, the management and security departments receive pre-alerts that help them to adjust cash balance in their branches in order to comply to the standards and internal security procedures they have predefined. 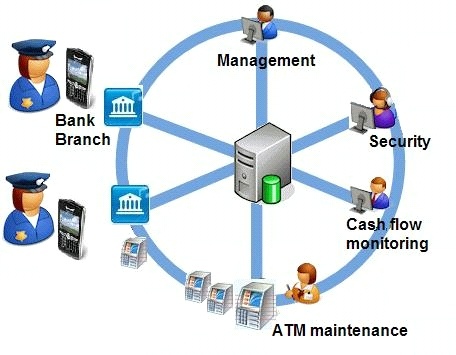 Practical, the system helps the bank to ensure that the actual amounts of money in each teller and ATM are the predefined, and controls if the proedures are followed in the whole chain. Management terminals receive total statistics data and reports, to help making adjustments in the overall security and cash flow policies. The system requires no user interaction or data entry by the tellers or other bank branch personel. Data entry using handheld devices is an optional feature only for cases of remotely located ATM's with no GPRS or other connetivity options. 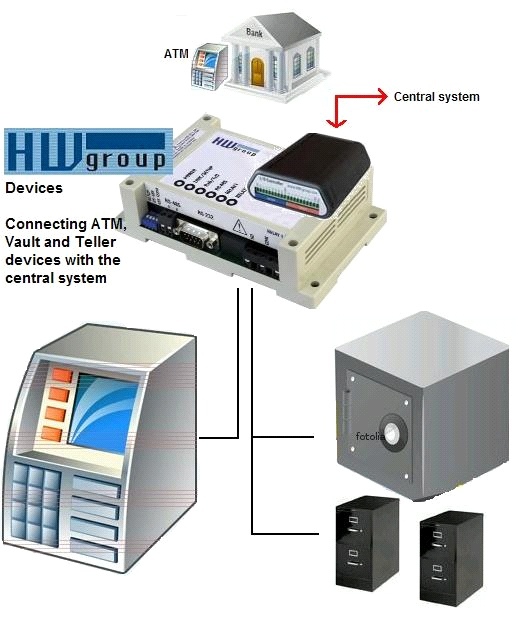 Each bank branch or ATM requires installation of one HW group data collection device. The devices read data through standard I/O wiring of door contacts, drawer inputs and vaults. Using encrypted and highly compressed communitation, data are redirected to the central system. Existing network infrastructure can be used without overloading the communications, due to low traffic requirements of the system. The maximum badwidth required per minute is 2Kb per branch. The compression features of the system enable low cost deployment, without the need to install separate networks. Communication between devices and central system is defined by static IP's and secured with internal encryption and with firewall rules that enable only single port peer to peer communication between device and server. Security low level details, informatio about penetration tests and network resource allocation tests can be provided after request. The system is certified for compliance to the international banking standards. Operation using the existing WAN infrastructure is an optional feature, due to the fact that the system allocates a small amount of network traffic. All rights reserved Copyright © Synapseis.gr 2007.